We are excited to announce that 4240 Architecture’s AESTUS project has been recognized by the American Institute of Architects (AIA) Colorado with a 2018 AIA Honorable Mention award, and, a 2018 AIA Notable in Denver award at this years AIA Colorado Design & Honor Awards Gala. Learn more about the design team’s process below and in the AESTUS compilation book. After winning the highest award for our entry to the annual Architecture at Zero Competition last March, we are humbled to additionally be recognized by AIA Colorado. 4240 Architecture's, AESTUS, does exactly that. Addressing the unique site constraints for a visitor's center and outfitters building on the San Francisco Bay for the Romberg Tiburon Environmental Research Center (RTC) at San Francisco State University, AESTUS has been interpreted as an undulating wave. A design where solutions grow from place and provide a site specific project that engages the inherent bioclimatic pattern language of the site and reflects the spirit and priorities of RTC. The design partii for the larger campus and subsequent project site takes on a fractured language to achieve a nuanced approach to shifting natural flows and landscapes and blurs the boundary between the bay and hill. The approach of breaking down the scale of aggregate space helps take advantage of the passive qualities of the natural flows of the site and establish a regenerative campus development strategy which celebrates and enhances the critical connections between the ocean, humans and science. 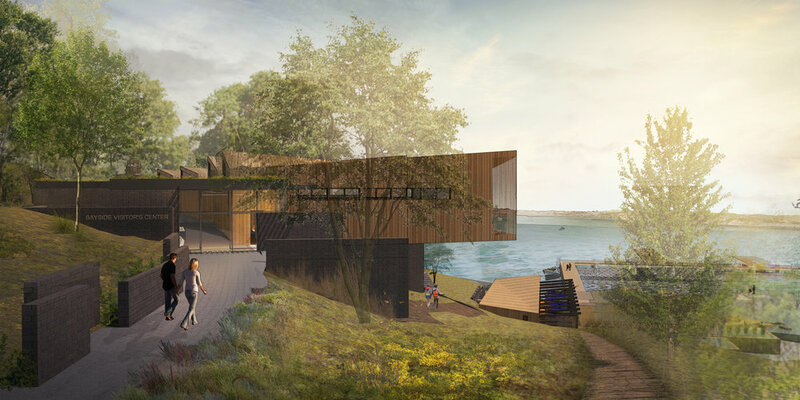 Utilizing technical and biological materials that tie into local ecology, the visitor center and related science on the bay building incorporate living building systems to move towards net positive energy, water and waste solutions which contribute to ecological and human health. These unique building system characteristics are synthesized with broader criteria for habitat protection, campus food production, renewable energy production, visitor education and, ultimately, research success. Because heating is the dominant energy load for this project, we used passive autonomy design as the primary building systems strategy, along with rooftop solar panels, to fulfill the project’s renewable energy profile and meet net zero energy goals. For the larger science campus, we anticipate using micro-tidal turbines to create a shared, 100% renewable energy district. Additionally, by employing the unique, passive HVAC concept of Indoor Weather, the building saves in additional energy consumption by mimicking the outdoor, natural atmospheric conditions inside while still maintaining interior conditions within an acceptable comfort profile. Ultimately, the project embodies influential, iconic, replicable biomimetic forms which strongly reflect the changing nature of the relationship between human society and coastal ecosystems and setup practical education with science on display. Thank you to Tom Hootman and Penny Cole at MKK Engineers for their help during this project.